Automatically transfer critical loads in the event of a power outage with the ASCO SERIES 300 Service Entrance. Rugged construction and proven performance assure the user of many years of reliability. 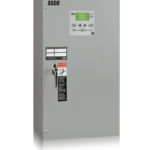 The Series 300SE is listed to UL 1008 standard for Transfer Switch Equipment and CSA standard C22.2 for automatic transfer switches. 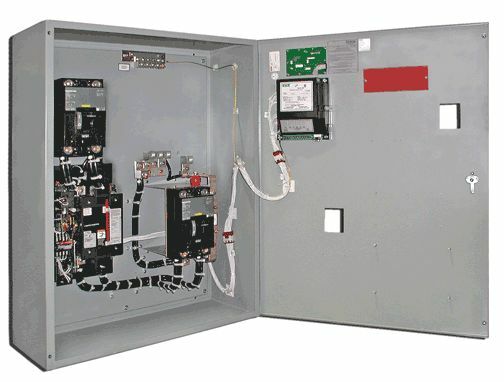 Meets NFPA 110 for Emergency and Standby Power Systems and the National Electrical Code (NEC) Articles 700, 701 and 702. True double-throw operation: The single solenoid design is inherently inter locked and prevents contacts from stopping between sources or from being in contact with both sources at the same time. There’s no danger of the Series 300 ATS transferring loads to a dead source because the unique ASCO single-solenoid operator derives power to operate from the source to which the load is being transferred. Operating parameters and feature settings can be adjusted without opening enclosure door. Compact design for optimum utilization of space. 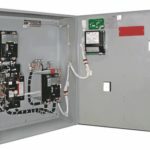 Designed to be completely front- accessible, permitting the enclosures to be installed flush to the wall and still allows installation of all power cabling and connections from the front of the switch. Numerous enclosure options including UL Type 1 (indoor) and UL Type 3R (outdoor).